Trams are back in the news of late. Auckland Transport planners theorise that Light Rail is the best option for future rail to the airport. I disagree with that (which you might find surprising coming from such an avowed tram advocate), but putting it simply, Light Rail, or trams, cannot provide a rapid, single-seat journey from Auckland International Airport to the city centre. On the other hand, electric trains – Onehunga Station is only 9km from the airport – certainly could. Trams in reality – not in theory – are now back in the Wynyard Quarter, after a break of 19 months while major road works took place. 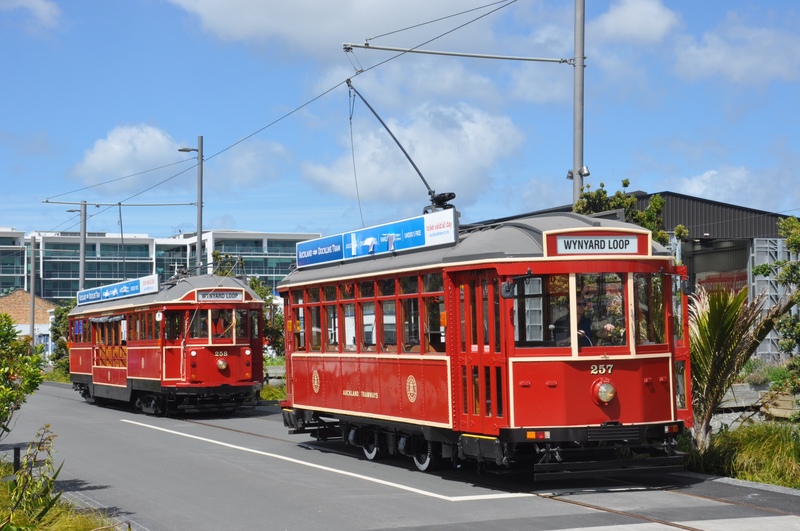 These are Waterfront Auckland’s heritage ‘Dockline’ trams – and they will be running on weekends from 10am til 4pm and Friday’s 4pm – 7pm until Christmas. Then, on Boxing Day until the end of January, it will be seven-days-a-week. After that there will be another break as the last section of road works gets underway for a few more months. There are also new, cheaper fares: family $5, adult $2 and child $1. Up until their enforced layoff in May 2013, despite the unfortunate over-pricing of the tickets at the start, the heritage trams, painted in traditional Auckland carnation-red livery, (with serial numbers 256 and 257, continuing on from the last Auckland trams), proved to be popular with the public. Despite the carping critics, more than 93,800 Wynyard Quarter visitors took the opportunity to take a ride on them. It was the first time trams had run in downtown Auckland streets since 1956. This was the fateful year that the city fathers, despite public opposition, ended tram services, dismantled the overhead wires, and destroyed most of the trams, selling the rest off as batches or sheds. Not content with that, and at huge cost for that time, they ripped out the 72km of tracks that reached most of the Auckland isthmus –obviously with the intention of making damned sure they could never be brought back. This was an Auckland tragedy. Up until that time, trams alone carried over 80 million of 100 million public transport passenger trips per year. Given that Auckland’s population was then only around 300,000 people and that now, 58 years later, with a population around 1.5 million, we carry only 74 million passenger trips a year – gives us some idea just how popular trams were. Indeed, allegedly car-obsessed Aucklanders up until 1956 were proportionately some of the most diligent public transport users in the world. The waterfront trams were an ARC legacy project that I pushed very hard for in 2009/10. Though they have an important role as a ‘point of difference’, and ‘place-making’, bustling around the developing Wynyard Quarter, they were never meant to be confined there. The whole objective, modest enough I thought at the time, was to get the line to the Britomart Transport Centre, where with state-of-the-art new trams, with super capacitors that don’t need overhead wires, they could be transformed from a visitor novelty to a serious public transport mode, running up Queen Street, where there are major pollution and noise issues from buses – and even along Tamaki Drive. Though perhaps we should have been looking at Ponsonby. But, extending the trams to Britomart was one of the most popular aspects of the 2011 Waterfront Plan. When the public was asked about this, 43% of submitters responded with ‘Do Now’, 30 % said ‘Do Soon’ and 13% said ‘Do Later’ and only 13% said ‘Don’t Support’. Three years on, despite this 73% or even 86% mandate, due to budget cut-backs and squabbling between Waterfront Auckland, Auckland Transport and Auckland Council, nothing has been done to get the tramway across to Quay Street and past the cruise ship wharves to Britomart. While some half a billion dollars is being spent by the Council on a questionable IT system which is meant to be ‘transformational’, no-one seems to be willing to spend the $30m to get the tramway across to Te Wero and on to Britomart. Now that would be transformational. Happy Christmas everyone. This article published in the Ponsonby News December-Jan issue. Nice article Mike. I think that the only way to the airport is to extend the heavy rail beyond Onehunga to the airport. I don’t think that Trams even after seeing the new Gold Coast system in operation could hack it. Seeing trams back in some form of CBD loop beyond what it is now would be great but good luck with that one with all the current council infighting and opposition that you will encounter.. Many thanks Paul. Happy New Year. Liked your article on the trams. Although living in Cornwall UK I was born in Devonport Auckland and can remember the trams in Auckland when I was a lad and was very sad when the then Auckland City Council under Dove Meyer – Robinson decided to do away with the most popular for of transport ever. However, to move forward, I believe that due to population increase, environmental advantages since 1956 and the ease of alleviating traffic problems in Auckland makes bringing back trams in modern form a big priority with some of the refurbished old Auckland trams to do tourists routes eg waterfront routes to St Heliers, Western Springs – MOTAT. and also a tram link from Onehunga Manakau link to Auckland International Airport. Now the story is cost! The longer it is left, the more expensive it will become. Just do it! Politics aside, it is for the benefit of the people of Auckland not for party politics to chew the cud over! Devonport Primary School had when I was a pupil a motto, ONWARD. Let us therefore go onward or forward in faith to get this project on the rails. Thank you. Is there a possibility of buying back from holiday bach owners some of the 90 odd trams that may be available that I understand from reports that many of these tram bachs are in good condition. Parts that are needed could be replicated with good kiwi knowhow. Understand also that business people in PONSONBY would be interested in getting the trams back as well using MOTAT collection. Why not have tram routes going from the Auckland Zoo and MOTAT to the CBD via K Rd, Simon d’s St Parnell down to the waterfront along to Britomart Railway Stn another route to St Heliers Mission Bay and another off to Ponsonby, Pt Chevalier, Avondale in fact all the routes that the original tram routes followed with modifications!